Here at The Real News, you know that we like to give you the story behind the story and provide you with some analysis. Here to discuss the relationship between the military and economic interests is Zeinab Abul-Magd. She is an assistant professor of Middle Eastern history at Oberlin College and American University in Cairo. She published a series of short studies on the Egyptian military and their economic enterprises. Thanks for joining us, Zeinab. ZEINAB ABUL-MAGD, ASST. PROF. MIDDLE EASTERN HISTORY, OBERLIN COLLEGE: Thank you. DESVARIEUX: So, Zeinab, let’s start off the conversation with President Morsi. As you know, he was the first civilian elected president in postcolonial Egypt. Can you discuss with us what was President Morsi’s relationship with the military before his ouster, particularly in the sense of how did they work together economically? ABUL-MAGD: Well, economically they had a perfect relation. As you know, the Egyptian military institution owns a huge economic empire. They own hundreds of the factories and companies and firms that they inherited from the Mubarak period. Mubarak allowed them to create such businesses. 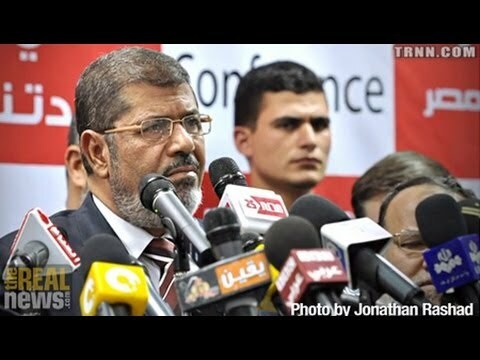 And when Morsi came to power, he made sure, in order to foster a good relation with the military institution, to maintain such economic enterprises and also allow the military to expand these enterprises, to build new factories, to create new companies, to invest in new things. So at the economic level they had a perfect working relationship together. DESVARIEUX: Okay. But the Muslim Brotherhood, which is the party of Morsi, as we were discussing earlier, were they seen as competitors for the military in terms of economically speaking? Were they competitors? ABUL-MAGD: No. In reality, the military businesses were competitors or were competing with the old business tycoon investments, because the old business tycoon of the Mubarak regime were owners of heavy industries in steel, in cement, in the chemicals, and such things. And the military was also building factories of cement and steel and heavy industry. So the military was competing with them, and this created a lot of tension between the military and the old business tycoon of Mubarak and Gamal Mubarak, which also helped with the military taking the side of the 2011 Revolution. But when it comes to the Muslim Brothers’ businesses, there is no competition between them, because the Muslim Brothers do not intend to invest in heavy industries. They invest basically in commerce. They are very good at importing goods, importing stuff from, especially, countries like Turkey and China and selling this stuff at a good profit here in Egypt. So they are very great at, you know, opening stores of imported furniture, imported food, grocery stores, things like this that have to do with commerce, basically, with importing and selling, whereas, as I said, the military, they invest in heavy, heavy, heavy stuff, in building factories, cultivating farms, things like this. So there was very limited competition between the two of them. And the Muslim Brothers also wanted to make sure that–they do not want to make the military angry. And then so they didn’t want to touch their enterprises or go into some tension in terms of competition with them. DESVARIEUX: Okay. Let’s talk about the man in charge, Sissi, who is the chief of staff of the military. What is his relationship to the business elite? ABUL-MAGD: The business elite, whether it is the Muslim Brothers business elite or the old tycoons of the Mubarak period, I don’t think that Sissi has any relation to them, because the military institution at large, they don’t establish immediate contact with local businesses, with national investors or national capital. They do have some relations with global capital, with Chinese capital or Chinese investors in technology, with the European investors and technology, American investors in technology, but they have very limited contact with national businesses. So [incompr.] they maintain their economic enterprises contained within the institution. So Sissi doesn’t have connections, business connections with local capital. DESVARIEUX: Can you elaborate a little bit more about the American ties to the military? ABUL-MAGD: Yeah. Of course, as you know, Egypt receives $1.2 billion of military aid every year. Part of this comes through that the military institution would purchase certain, you know, equipment from American military business complexes. But also part of it is is that the military, the Egyptian military could use the civilian products in collaboration with American capital. And the big and famous example of this is the Chrysler company, you know, the Chrysler company that produces cars, the Jeep cars and other kinds of cars in addition to tanks and some military equipment. They collaborate with the Egyptian military in the production of the Jeep cars or the assembly of Jeep cars in Egypt and others. So this is just one example. DESVARIEUX: So I want to get your take on the newly appointed prime minister, Hazem Al Beblawi. What is your take? He was the old finance minister. Now he’s the prime minister. And he comes from an economic background. Can you give us a sense of what his career was like? What does he stand for? What sort of policies will he be advocating for? ABUL-MAGD: Yeah. Well, the guy is a great guy. He is a good economist. He adopts neoliberal–sort of a neoliberal stance in the economy. He was a good minister when he was a minister. But still he is a great disappointment to the youth of Egypt, the revolutionary youth of Egypt, and to a lot of people, because he’s too old. The guy was born in 1936, so he’s 77 years old. And he cannot really, you know, envision or he cannot really grasp what the youth on the streets want, what the younger generation of even the people who are in their 40s or 50s, the Egyptian people who are in their 50s or 40s or 30s, their anticipations and their hopes after the new wave of the Revolution. He’s good and great and he stands for–he had a very successful career in terms of neoliberal economic policies. But a lot of people are disappointed and don’t think at all that he’s the right choice for the moment that Egypt is living right now. DESVARIEUX: Okay. So when you say neoliberal policies, can you talk about any specific policies? ABUL-MAGD: I think he’s fine with issues like privatization, eliminating subsidies from farmers and from bread and gas and these things. He’s fine with, you know, the package that comes with economic reform, the economic reform package that comes from the IMF and the World Bank. He’s fine with all these things that has to do with liberalizing the Egyptian economy. And these are the policies that Mubarak applied since 1992 onwards, and Gamal Mubarak accelerated these policies in the 2000s. And these are the same policies that also Morsi applied when he came to power throughout last year. And a lot of global or international actors would want to make sure that Egypt would still continue on the path of neoliberal economic reform that gives–where the state withdraws largely from the economy and privatizes its enterprises or its properties, and where the private sector plays the major role in running the economy, and also where subsidies from basic goods are eliminated. So I believe Hazem Al Beblawi is a good choice in the eyes of a lot of people in the international community, especially the U.S., that would want to see Egypt continue on the path of economic liberalization. But he is a great disappointment to the young people of Egypt. He’s just irrelevant. They see him as irrelevant. And also they see the entire package of economic liberalization not suitable for Egypt at this moment because the Egyptian Revolution in 2011 and also this new wave of June 30, they both emerged because of the cause of social justice and because of the cause of, you know, the minimum wage giving to workers and the lower classes of employees and people, especially young activists, those young revolutionary activists who do not believe that neoliberalism is the right path for Egypt to go now. So if you bring a prime minister who’s first of all too old, almost the age of Mubarak or a few years only younger than Mubarak, in addition to that he doesn’t really feel the needs of the streets in terms of social justice and minimum wage and all the demands of the poor because he is a typical liberal–economically liberal guy, a lot of people don’t believe that he would really deliver what the revolutionary movement needs. DESVARIEUX: We’ll certainly be continuing this conversation. Thank you so much for joining us.